The social CRM conversation has gone to an all-new level over the last couple of weeks. It seems to have caught the attention over everyone lately, which is a far cry from 2007 when I started writing about it. But now we're starting to see some real movement in terms of actual products and services aimed at helping businesses strategically use "social stuff" to create meaningful relationships with those turning to the web for help. Oracle has created several social CRM products to enable sales organizations within the enterprise to more effectively collaborate with each other - and with external partners - to improve the sales process. And other CRM vendors, along with third party developers, are beginning to create links to their apps/services from some of the popular social sites. But deep integration between CRM applications and public/private social networks is beginning to take shape. 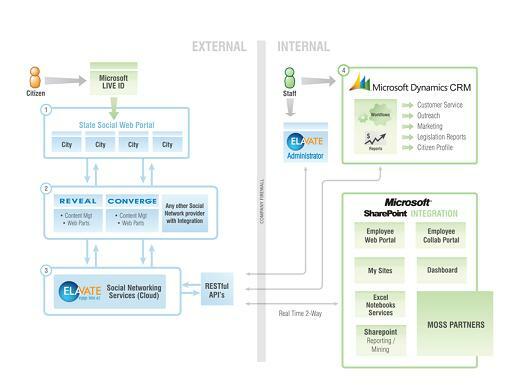 A few weeks back at Microsoft Convergence, Microsoft and social network platform provider Neighborhood America (NA) announced the integration between Dynamics CRM and Elevate - NA's enterprise social network platform. This partnership is a part of Microsoft's Gov 2.0 public sector initiatives. As Paul Greenberg said over on his ZDNet blog, this integration isn't the only one, but it is a compelling one. It's compelling because new community members creating a user profile on the Elevate platform side will have a new contact record automatically created on the Dynamics CRM side. And any update a community member makes to to their profile will also carryover to the contact record. Having this kind of connection allows you to associate activities performed by community members on the social networking side with their contact records in the CRM database. But this is not part of the integration,as contact-level information flows into Dynamics CRM from NA, while activity level data does not. Right now that would mean pulling this information from two separate data sources - NA's social networking data store and the Dynamics CRM data store. It probably also means needing a data-append service on the CRM side to fill out the missing pieces of information needed to really understand who these individuals are. This is because you're not likely to get all the profile info you'll need from folks creating a profile on your community site, who'll typically fill out the least amount of info required of them - at least until they reach a certain level of comfort. So we're moving slowly but surely in the right direction. But we're still in the very early stages of this whole social CRM thing. So check out a conversation I had with Microsoft Strategic Alliances Manager Amir Capriles, and my good friend Michael Thomas - Neighborhood America's Director of CRM/Social Media, as we discuss this partnership. We talk about why both sides thought it was time for this kind of integration, how it works, and what it means to the end users - in this case citizens receiving services from different levels of government. They also talk about the public sector idea bank Microsoft is rolling out built with NA's "idea-floating" product - Reveal. Click on the player below to hear the conversation or download the mp3 file.